"Whose dominion is in all places." " I am the L-RD that healeth thee" (Exodus 15:26). "For ever, O L-RD, Thy Word is settled in Heaven" (Psalm 119:89). "He sent His Word, and healed them" (Psalm 107:20). "I will hasten ('watch over') My Word to perform it" (Jeremiah 1:12). shall I be afraid? You will bring me through, and I will praise Your Name, forever! TO SEARCH AND DESTROY TERRORIST STRONGHOLDS. PRAY ESPECIALLY THAT THE PLANS OF THE WICKED BE FOILED. ed evil unto him that was at peace with me; (yea, I have delivered him that without cause is mine enemy:) Let the enemy persecute my soul, and take it; yea, let him tread down my life upon the earth, and lay mine honor in the dust. Selah. Arise, O' L-RD, in Thine anger, lift up Thyself because of the rage of mine enemies: And awake for me to the judgement that Thou hast commanded. So shall the congregation of the people compass Thee about: For their sakes therefore return Thou on high. The L-RD shall judge the people: judge me, O' L-RD, according to my righteousness, and according to mine integrity that is in me. O' let the wickedness of the wicked come to an end; but establish the just: for the righteous G-D trieth the hearts and reigns. My defence is of G-D, which saveth the upright in heart. G-D judgeth the righteous, and G-D is angry with the wicked every day. If he turn not, He will whet His sword; He has bent His bow, and made it ready. He hath also prepared for him the instruments of death; He ordaineth his arrows against the persecutors. Behold, he travaileth with iniquity and hath conceived mischief, and brought forth falsehood. He made a pit, and digged it, and is fallen into the ditch which he made. His mischief shall return upon his own head, and his violent dealing shall come down upon his own pate. I will praise the L-RD according to His righteousness: And will sing praise to the Name of the L-RD Most High." (Psalm 7). it for His Glory, Honor & Praise. * For America to repent and return to G-D in all her ways. * For healing of a sister-in-law diagnosed with cancer. * For G-D's comfort and peace over a family who'd recently lost a beloved son in an automobile accident. * For G-D's peace and protection over our military troops throughout the world, and their loved ones. * For our leadersto be guided and led by G-D's wisdom. * For a father who is scheduled for back surgery. * For healing and deliverance of a young man who is suffering from great bouts of depression. * For a young girl who will undergo breast surgery for removal of a tumor. * For G-D's wisdom to rule in the hearts of a young couple who'd recently married. * For a daughter-in-law who is presently with child. * For a mother who is scheduled to undergo hospital tests for diabetes. * For Ray, a cancer survivor who is suffering from tremors in his body. * For a couple in need of a car. * For a son seeking employment in his career field. * For a family suffering financial crisis. * For healing and restoration of broken family relationships. His Chosen people, Israel, into the sea. May He raise up Israeli leadership after His heart. and will bring them down into the valley of Jehoshaphat, and will plead with them there for My people and for My heritage Israel, whom they have scattered among the nations, and parted My land" (Joel 3:1-2). * For Maxine, an 80 year old woman who'd recently fell and broke her hip. * For G-D's peace and protection over a father and daughter who are presently visiting family in Israel. * For a son who is seeking a job in his career field. * For G-D's peace and protection over the US Miltary and other Coalition Forces worldwide, including their families. bless the Mayor of Jerusalem and all other officials for their stand against the event. everyone who prayed for his healing. He is a walking miracle, Hallelujah! *** Joann's MRA test came back negative. She, too, is praising the L-RD for answered prayer. *** Mr. Cundiff, the grandfather who was gravely ill with staph infection and who had several of his toes amputated, is recovering wonderfully. He is now able to wear shoes for the first time since his operation. May G-D bless those who've prayed for his healing. sister to sickness, and who'd just recently suffered a divorce. * For Joann, who'd recently undergone an MRA test to determine if she has a cyst in her head. Please pray test comes back negative. to all the love and prayers sent his way. What a Mighty G-D we serve! * For Mr. Nesbitt. who was recently hospitalized for heart surgery. * For John, who'd recently undergone quadruple bypass surgery. * For Bob, who'd recently suffered a stroke. * For Mr. Arrowroad, who is scheduled for open heart surgery. * For Diane, who was found to have an enlarged vein on her temple area. * For a physically abusive husband. Please pray G-D's protection over wife and children. * For a nephew who needs G-D's wisdom, strength, and encouragement in raising his 3 children. * For Ray S., a cancer survivor who was recently hospitalized for numbness (possible stroke). Doctors also found a mass in his brain. * ForPaul, a husband and father who'd recently lost his very dear friiend to cancer. * For Charlie, who'd recently lost his wife to cancer. Please pray especically for G-D's direction in his life. You have known His miracle in the crisis hour. You have proved His promises in your life anew. "Thank the L-RD for all He's done; He is still the same. He can do for you today more than all His fame. But He longs to prove today new realities. You can see new miracles as by Him you're led. Thank the L-RD, but, oh, beware; don't live in the past! All the L-RD has ever done still can be surpassed. "Yes, His pow'r is just the same; this is still G-D's day. He today among us stands in our present way. Lift your eyes in faith to G-D; prove His grace anew. G-D is waiting yet to show what His pow'r can do." *** David, the man who'd recently undergone heart surgery, is at home recovering. He sends his thanks and deep appreciation for your love and prayers. G-D bless you all! * For Taleen, a young girl who is presently scheduled to undergo breast surgery. * For Ms. Anna, an elderly woman who was hospitalized with a broken hip. * For Lori, a young mother who is terminally ill and whom doctors recently sent home to die. * For Ms. Maupin, who was hospitalized with congenital heart failure. * For Barbie, a young mother who was diagnosed with liver cancer. * For Michael, a two year old boy who was recently hospitalized with a hole in his lungs. * For David, a man who is presently recovering from open heart surgery and is scheduled to undergo another corrective heart surgery. * For Joshua, a young boy suffering from hearing loss. * For Sylvia, a mother/grandmother who'd recently undergone surgery. Please pray biopsy is found negative. * For godly judges to be elected to office in America and in Israel. * For Christians and Jews throughout the world who are being persecuted for their faith in G-D.
* For the peace and safety of our coalition forces in Afghanistan and Iraq. minds, and souls with His great SHALOM [PEACE]. .
* For the Jewish inheritors of the land of Israel. Pray that they will not be forced from their G-D-given land for the sake of Mid-East peace. * For the protection of Israel's borders from all people and nations who seek to destroy Israel. * For the protection of America's borders from illegal aliens, Islamic terrorists, and all people and nations who seek to destroy America. * For Amanda, a young girl scheduled to take dental board test. * For Rosie, a wheelchair-bound woman who'd recently undergone surgery. Please pray for a full, speedy recovery. * For David, a man who'd recently undergone his third open-heart surgery. * For Butch, a man who'd recently been hospitalized with emphysema. Pray especially for his salvation. * For a man who is suffering from arthritis. * For a man who'd recently been diagnosed with congenital heart disease. * For an elderly man who's suffering from chronic arthritis and heart disease. * For a mother who'd recently been diagnosed with diabetes. * For a priest with uncontrolled diabetes, who is presently self-administering several insulin injections per day. * For a woman who needs to confront and deal with her past so she can be free to live her life in the present. * For a family seeking financial freedom. * For a grandmother who is presently scheduled for hospital tests Pray she'll obtain a good report from her doctor. * For a young couple who are trying to conceive a child. * For siblings who've strayed from the L-RD. Pray they will return to the old ways in which they were taught. also blessed him with a beautiful grandson who was born on March 18th. Please pray for Jessica, the baby's mother, as she will have to undergo gallbladder surgery. * For a family who is needing a financial breakthrough. * For a sister who is suffering with flu like symptoms. * For a brother who is suffering great bouts of depression. and State level] from their offices, and replace them with judges who will honor Him and respect life. man according to his works? " (Proverbs 24:11-12). * For Carl S., a grandfather who is presently suffering with larynx cancer. * For a young mother who is presently in labor and delivery. * For a young couple who'd recently given birth to a baby girl with life threatening birth defects. * For an uncle who is suffering with lung cancer. Heavenly Father, thank You for hearing the cry of the human soul. You, O' L-RD, are the Comforter of all the sorrowing. You alone are our hope and constant source of strength. We will trust and not be afraid. Behold, You make all things new, a promise that shall yet be fulfilled. Clipped wings will grow again. * For Annupamma, a 31 year old mother diagnosed with a terminal illness, that our Heavenly Father would heal her and make her whole. Please also remember her 10 year old daughter in your prayers. * For Ashley who is desiring a closer walk with the L-RD. * For Stacey, regarding advancement in her job. * For Chris and Lucy, that they may come to know the L-RD in a personal way. * For a son who'll be interviewed for a job that meets his qualifications and desires. * For a young mother who's been diagnosed with gall bladder disease. the Horn of my Salvation, and my High Tower. I will call upon the L-RD, Who is worthy to be praised; so shall I be saved from mine enemies. The sorrows of death compassed me, and the floods of ungodly men made me afraid. The sorrows of hell compassed me about: the snares of death prevented me. In my distress I called upon the L-RD, and cried unto my G-D: And He heard my voice out of His temple, and my cry came before Him, even into His ears. *** The father / grandfather who'd recently undergone surgery for staph infection is out of the hospital and is recovering at home. * For G-D's peace and protection over the Iraqi people, as they participate in their first democratically-held elections. Father grant Mr. Cundiff a speedy recovery. * For Jessica, a young pregnant woman diagnosed with diabetes. May G-D's love, peace, and protection shield her and her unborn child. * For a lonely elderly woman who has no remaining living family members. * For a father who is scheduled for back surgery due to infection. * For a son in dire need of a job in his career field. * For a young couple who are unable to bare children. * For a nephew who's taken sole responsibility of raising three small children. * For a sister diagnosed with lyme disease. * For all the family members and friends of the victims of the recent earthquake/tsunami disaster in Asia. May G-D's compassionate love bring healing and peace to these broken hearts and shattered lives. * For a woman who is having financial difficulty due to her health insurance company's unwillness to pay benefits..
* For Christians everywhere to continue blessing Israel through prayer and support. * For the family members and friends of those who'd died in the massive Asian earthquake last Sunday (December 26, 2004). victims who are trapped under the rubble. * For Melissa, a young mother who'd recently been diagnosed with cancer. * For John, a beloved grandfather who'd recently been hospitalized in ICU. * For a young nephew who'd turned his back on G-D and is running from the law. * For a young girl, Ta, and her family, that G-D would guide them in her career decisions. * For Jonathan, a young man who'd turned his back on G-D and his family. to marry her and to be responsible in raising the babies in the fear and admonition of the L-RD). * For Penny and family, who'd recently lost her father to heart attack. * For Ray S., recently diagnosed with cancer of the lymph nodes. her gallbladder would be a very delicate task for the doctors. * For William, who'd recently suffered a puncture wound to one of his lungs due to an auto accident. * For Donyale and her son, Travis, who will soon have to undergo surgery for tumor removal. * For Hazel, who'd recently lost her mother to ovarian cancer. * For Paul, who'd recently undergone triple bypass surgery. * For Vickey, who is suffering from kidney disease and has to undergo dialysis three times a week. * For a son in need of a job. * For Nicholas, who is presently serving in the military. Please also remember his wife and young daughter in your prayers. leaders after His heart, who will honor Him and will lead the people back to righteousness. safety. Pray also that G-D will deliver the enemy into their hands. and brought down, and may all the leaders in the US and Israel who are aiding, abetting, or even "making peace" with terrorists be quickly removed from their offices and replaced -- by Almighty G-D Himself..
they commune of laying snares privily; they say, who shall see them? They search out iniquities; they accomplish a diligent search: both the inward thought of everyone of them, and the heart, is deep. But G-D shall shoot at them with an arrow; suddenly shall they be wounded. So they shall make their own tongue to fall upon themselves: all that see them shall flee away. And all men shall fear, and shall declare the work of G-D; for they shall wisely consider of His doing. The righteous shall be glad in the L-RD, and shall trust in Him; and all the up-right in heart shall glory" -- (Psalm 64). * For Sylvia, a precious woman of G-D who was recently diagnosed with heart problems. *** Sylvia underwent heart surgery and was found to have a healthy heart. Hallelujah! * For Donnie, a man whose spine needs healing from degenerate bone disease. * For the spirit of repentance and revival to fall upon the Carribean island of Aruba. there's no longer a trace of blood found in his urine. To G-D be the Glory! * For Lorie, a 40 year old woman recently diagnosed with cancer. * For Joshua, a special young boy who is presently hospitalized for kidney stones. * For the families and friends of our military and civilian workers in Iraq, who were recently kidnapped, wounded, or murdered by Islamic terrorist aggressors. Our love and prayers are with you -- always. those who place their hope and trust in Your holy Name. Amen. * For Ms. Francis who is presently suffering serious health problems. * For Jamie, Sarah and Brad who are "spiritual lighthouses" in our community. Pray especially for their health and welfare. for His glorious kingdom's sake! * For a sister who is having to undergo a major operation. We are believing G-D for a miracle! * For my son, Jim, who is working on his internship. Please pray he'll be able to keep the apartment he is living in, for the remainder of his present rotation. Pray also for added strength and encouragement that He might complete his work in a timely and orderly manner. * For a nephew who desperately needs G-D's divine intervention in his life. Though his life looks hopeless, we are believing G-D to turn it all around for His glory! Please know we welcome your added prayers of faith. our Heavenly Father bring peace and comfort to your souls. Our love and prayers remain with you always, especially during your time of grief. International Wall of Prayer - reaffirms our denounciation of all violent acts aimed against the State of Israel, and the entire Jewish Nation. While there, he will be meeting with local home churches, sharing the message of "Unity Amongst Believers", and on Hebraic Roots". He will also be attending a large meeting in the Hague on the 19th. [Paul is with "Come to Zion Ministries"]. of my fellowman. You alone know the heart that is broken, the soul that languishes in despair, and the body that is afflicted. L-RD, I am humbled by Your mercy and concern for the lost, the hurting, and the dying. Help me to release my simple childlike faith in You, believing You for miracles of healing, deliverance, and restoration. According to Your Holy Word, with You all things are possible to them that believe. In Your Holy Name I pray. Amen. * For the families and friends of all those who've been wounded or murdered in recent acts of terrorism. * For the foiling of all future acts of terrorism. Pray that the perpetrators will be caught and brought to justice. Pray also that all hidden cells and weapons will be found. * For peace and protection over the coalition forces stationed in the Middle East and throughout the world. * For Barb, a mother who is scheduled for surgery to have a tumor removed from her throat. * For a family member who recently fell and seriously hurt his back. * For David, a young boy who was recently diagnosed with bronchial pneumonia. Heavenly Father, everlasting Mercy, grant me a tender heart towards all those in whom the pulse of life grows weak: The tired and weary, who have given up all hope; the bereaved, whose hearts and homes lie desolate; the sons and daughters who are so far from home; the cold, and hungry; the broken hearted suffering great anguish and pain; and the ones who are facing dangers unknown. L-RD, let Your presence be with them, turning their loneliness into comfort and their chaos into peace. In Your Holy Name I pray. Amen. * For Becky, a wife and mother who recently had surgery to remove a benigh tumor from her brain stem. She is presently recovering in I.C.U. * For Kelly, a young woman who is in the final stages of renal failure. Last year she had a bad kidney removed, but now the remaining kidney is not performing as it should. Kelly has been prepared for dialysis as a temporary solution, but a transplant is an option that her physicians are pursuing. came through that experience very well. * For a father who has recently been diagnosed with digestive problems and cancer. * For a mother who recently fell in her home and sustained traumatic (not life-threatenting) injuries to her body. * For Joe, a man who is presently writing a book on the Mishnah. Please pray against all distractions, which try to prevent this work from being completed. * For Hatikva Ministries. May G-D's blessings continue to meet your every need -- for His glory, honor and praise. time off, but to no avail. Please pray also for her husband who was involved in a serious car accident. "Heavenly Father, Your Holy Word says "With G-D all things are possible". Forgive me for looking to man for the answers to life's questions. Today. I have decided to look to You. "I will lift up my eyes unto the hills, from where comes my help. For my help comes from the L-RD, which made heaven and earth" (Psalm 121:1-2). Thank You, L-RD, for making a way for me, where there is no way. Thank You for Your great love, care, and concern. Thank You for giving me the answer that I need today. Thank You for guiding me that I might know how to serve You better... to invest my life in Your service ... and I'll praise You for it. For You have placed me into Your universe with a plan and a purpose for my life. You care for me. You plan and prepare for me. So I do not fear tomorrow nor am I afraid, for my trust is planted firmly in You, my L-RD and my G-D. In Your Holy Name I pray. Amen. fret not thyself in any wise to do evil. For the evildoers shall be cut off: but those that wait upon the L-RD, they shall inherit the earth" (Psalm 37:3-9). * For my mother who is experiencing high blood pressure, fever, and kidney problems. * For my father who is in very poor health and is experiencing pain in his hands. * For Mathew, a young man who is suffering from bouts of depression. Please also pray for Mathew's brother. * For financial blessings for my family. You are in control. I thank You that my prayer is heard, for I ask it in Your Most Holy Name. Amen. "Shall the prey be taken from the mighty, or the lawful captive delivered? But thus saith the L-RD, even the captives of the mighty shall be taken away, and the prey of the terrible shall be delivered: for I will contend with him that contendeth with thee, and I will save thy children" (Isaiah 49:24-25). *** While we were in Montgomery, Dr. James Dobson came there in person and spoke. The most impressive point he made is that the issue is not the Ten Commandments Monument, or Judge Moore, or even the Ten Commandments. The real issue is judicial tyranny. A handful of Federal Judges are trying to force their world view onto the rest of the nation. A recent poll showed that 77% of Americans disagreed with the taking the Ten Command-ments monument out of the Alabama Courthouse. Right after Dr. Dobson spoke, it was reported that the Governor of Mississippi announced that he would be glad to take the Ten Commandments monument from Montgomery and place it in the Capitol of Mississippi! hear from heaven, and will forgive their sin, and will heal their land" (II Chronicles 7:13-14). * For my mother who is scheduled for heart surgery on Wednesday, August 27, 2003. May G-D's peace and protection watch over her and keep her safe , during this very critical time. Please know that I covet your prayers. *** Because of your prayers, my mother's surgery and recovery was successful. May G-d richly bless you for your love, care, and concern. * For the families and friends of those victims who were viciously wounded or murdered in August 19th's terrorist (bus) attack, in Jerusalem. Our condolences go out to these families and friends. May our Heavenly Father bring healing to your broken hearts, filling them with His blessed Shalom [Peace] and comfort. Our love and prayers remain with you always, especially during your time of grief and mourning. "The L-RD is near unto those who are of a brokenheart, and saveth such as be of a contrite spirit" -- (Psalm 34:18). 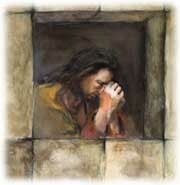 my cry; for I am brought very low: deliver me from my persecutors; for they are stronger than I. Bring my soul out of prison, that I may praise Thy Name; the righteous shall compass me about; for Thou shalt deal bountifully with me" -- (Psalm 142:1-7). * For complete healing of a precious mother, named Flora, who'd recently suffered a heart attack (congestive heart failure) and is still listed in serious condition. * For a daughter's complete deliverance from the spirit of alcoholism, and for G-d's healing and restorative power to touch every area of her life. * For her father's total healing and restoration from the years of pain he'd suffered over his daughter's drinking. *** The father from the above paragraph praised the L-RD for healing his ears, after enduring a few months of serious ear trouble. Hallelujah! * For peace and safety of our airman son, who is proudly serving his country in the desert . * For the protection of the Kentucky Air National Guardsmen and women who are enroute home from the Middle East. Most Holy Name, forever! Amen. "Some trust in chariots, and some in horses; but we will remember the Name of the L-RD our G-D" -- (Psalm 20:7). * For a sister who is being treated for lyme disease. * For an uncle who has liver cancer. *** Sylvia's tests returned negative. * For a young father who is comatose due to a recent car accident. * For a mother who had recently undergone knee surgery. * For an elderly woman who is suffering terrible arthritic pain throughout her body. You seem so far away. Bring me up out of the shadows and let me feel Your Light shining upon my soul again. I know that You are concerned about me! You bring only good to me! Cause my bones to rejoice in You, once again. It's in returning to Your circle of love and great compassion that I will find my rest. Thank You, L-RD, for never deserting me, even through my trials. My Father, You are all I need and so much more. In Your Matchless Name I pray. Amen. *** My sister-in-law, Dilek, passed away on June 14, 2003. Please remember my brother John, his children, and the rest of our family in our time of grief. We covet your prayers. Chapters 83, 130 and 142.
prayers remain with you always, especially during your time of mourning. this? Why didn't we see this coming? "Why? Why?" we ask, but there seems to be no answer. We may never know why. Who of us has not walked through the valley of despair? Who of us has not shed lonely, bitter tears? Who of us has not been almost crushed by the weight upon our hearts, a burden sometimes unknown to those around us? Today we come to share our sorrows and to find strength in each other and in G-D. In G-D? Yes, for G-D can help us sift through our feelings and enable us to put our lives back together. He is the L-RD of life, L-RD of the grave, and L-RD of eternity. G-D knows how we feel today: hurt, dismayed, uncertain, alone. He also understands us better than we understand ourselves, and He can comfort our aching hearts and help us go on. * For the Elliot family, who recently lost their eldest son to a tragic death. May G-d's comfort and peace be with them in their time of grief. * For Gina, a young woman who'd recently suffered a massive heart attack. Doctors told her family she had a 50% chance of survival. O G-D, our Father, Your children come today asking You for Your help. Thank You, L-RD, for strengthening us when we are weak; You lift us up when we are down. When we are lonely and afraid, You are there to comfort and protect. We ask for strength just now, for health, for a complete and joyous recovery. We confess our sins and ask for cleansing, through Your Holy Word. We give ourselves completely over to Your care. Hold us close, and keep us from all harm. L-RD G-D, source of life and health, we are thankful to know that You are always very near us. You have brought us through so many difficult situations; You have heard and helped us so often before. We come now, confident that, even before we ask, You are still with us. In all things, You work for the good of those who love You. We ask for Your blessing today for strength and health and peace. Ease our distress and calm our troubled spirits. We know that You can bring quiet and rest to our wearied souls. We ask this and so much more -- In Your Holy Name we pray. Amen. * For a 3- year-old granddaughter, named Elizabeth, who recently had to undergo surgery for a hole in her bowels. * For a 3-week-old baby, named Benjamin, who is presently recovering from having had a pacemaker placed in his tiny heart. *** Baby Benjamin was released from the hospital and sent home with a good report. * For Joni, a young girl who is scheduled to take 2 MRI tests this afternoon. * ** Joni's MRI tests reveal all is well. * For John, a young boy who needs a miracle of healing for his body. * This morning, a very dear friend of mine called me requesting prayer for a young mother of two who was diagnosed with breast cancer. Please remember Laura in your prayers, believing G-D for her complete healing. Dear friends: My son Shmuel Yitzhak ben Tziporah has cancer. My family would be grateful if you would say a misheberach for him. it will be a miracle. Please keep praying with us for that miracle and, even better, than even the sight in the left eye will be restored. Thank you again for your prayerful concern for Alice. Loving greetings from Betsy. * For the salvation and healing of my in-laws, especially the father who suffers terribly with unresolved back pain and my mother-in-law who has had crippling arthritis for many years. * Pray that my husband, who is a completed Jew, will someday tell his parents of his conversion to Yeshua. "But it is good for me to draw near to G-D; I have put my trust in the L-RD G-D, that I may declare all Thy works" (Psalm 73:28).